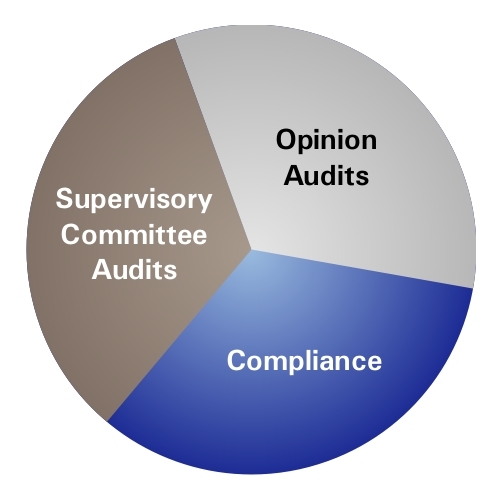 A clean, unmodified opinion is the outcome you want for your financial statements. But meeting regulatory requirements isn't the only goal; in fact, with Summers, Carroll, Whisler LLC it's just the beginning. We understand your business and the risks inherent in accounting and financial statements reporting. For better protection, we have a tailored process that gives us an understanding of the unique aspects of your financial institution's business. Financial institutions are not best served by "cookie cutter" solutions, and we won't treat your business that way. Our audits are hands-on, and phone support is available throughout the year to help you operate at your very best. We also provide an analysis that includes your financial overview, graphical analysis, recommendations, and updates to keep you a step ahead in the industry landscape. "NCUA is not representing that a Supervisory Committee which performs or has performed these minimum procedures, and these procedures only, will have fully met the requirements of Part 715. The Committee remains responsible to ensure that a complete set of procedures is performed." The responsibility - and risk - still falls on you. In such an environment, you need confidence that you are meeting all standards that apply to your unique situation. Summers, Carroll, Whisler LLC is the expert partner who will give you that assurance. Keeping abreast of regulatory compliance issues is more daunting than ever. Compliance covers all areas of your institution's operations, and the regulations are constantly changing. A regular review and assessment is simply a must in this environment. At Summers, Carroll, Whisler LLC, we have tailored our wide range of compliance services to the other great challenge that is present in your institution - time. With all the demands and time restraints on your staff, we have found it is often easier to break down compliance into smaller areas. Doing so gives your staff time to develop a plan to correct any deficiencies found - in addition to doing their "regular" jobs - before moving on to the next compliance area.